Outline: About Christ; His life, miracles, death, resurrection, ascension--- all without mentioning His name till the last paragraph. For fanatic Muslims who spurn the name of Jesus. Name can be introduced at beginning if desired when using for other groups. I want to tell you about a man who once lived on earth. He was always good. Many people loved to hear His words. He never spoke evil. He never spoke a lie. He spoke only truth. This man was also mighty. 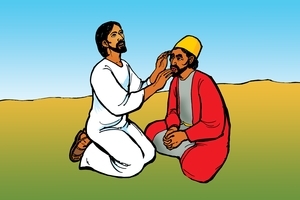 One time He put His finger upon the eyes of a blind man, and this blind man's eyes were opened. He could see. On another day, this good man healed ten lepers. This was a little task for Him-you haven't heard yet of the most difficult thing He did. One time He saw a crowd of people carrying a young man who had died. They were taking him to bury him. His mother was weeping. This good man felt sorry for her. He walked into the crowd and spoke to the dead man. Immediately he began to breathe. He got up. He was well again. Now all the people rejoiced in the wonderful work of this good person. This good man, who is He? This man was good. But those who liked to do evil began to hate Him. And one day, they caught Him and took Him to court. (They told lies about Him, they struck Him, and spit upon Him.) And then they took Him and nailed Him to a cross. On this cross He hung until He died. This good man had great power, yet He allowed wicked men to kill Him. Why? Because He wanted to give His life for the sins of all people. Just before He died He shouted, "God, forgive these people because they do not know what they are doing." Then He died and was buried. But He did not remain in the grave. On the third day He arose and walked about. His disciples saw Him. They talked with Him and ate with Him. Before He returned to His place in heaven with God, He talked to all His friends. He said, "You must take my words and go teach people in every place." "Truly I say unto you, he (all) who believes on Me has everlasting life." Now the person I am talking about, who is He? He is Jesus, the One God sent. (Son of God). God is the Great Spirit (One) Who created all things. God loves all people. Therefore God sent Jesus to save us. All who trust in Jesus, He will receive. He will keep them and when their bodies die, He will bring them to the good place with God. Jesus is God's great gift to all people. We must receive Him. Jesus can take away our sins. He can change our lives and make us good. He can give us a home in heaven. Let us trust in Him. We must not refuse Jesus. GRN has recorded a version of this script in 679 languages and dialects. See full list.